Originally from Belgium and based in Ghent, SEA-INVEST has grown into one of the world’s largest terminal operators for dry bulk, fruit and liquid bulk. Its core activity is loading and unloading cargo vessels. With an annual tonnage turnover of 100mt (million tonnes), the company is active in 25 ports spread across two continents and eight countries: Belgium, France, the Netherlands, Poland, Ivory Coast, Senegal, Cameroon, and Tunisia. SEA-TECH was created as a subsidiary of SEA-INVEST in 2001 and is dedicated to port and handling engineering. Historically, dedicated to the design and implementation of handling port activity, SEA-TECH has grown with the projects it has been entrusted with for almost ten years, both in and outside of the group SEA-INVEST. Thanks to its experience, the company can respond to all issues of planning and ports logistics. SEA-TECH has established a team of engineering and maintenance specialists dedicated to technical missions to assist its customers in daily monitoring of equipment installed on site. SEA-TECH has structured its organization and its methods of work around engineering and maintenance to fulfil requests from terminal operators and contractors and to solve their engineering problems and to offer technical assistance in the field of cargo handling and port logistics. SEA-TECH has established a team of specialists dedicated to technical projects to assist its customers in daily monitoring of equipment installed on the site. A technical management presence on each monitored site allows SEA-TECH to enjoy great feedback on the solutions implemented in their operating environment. Different from a classic engineering office, Sea-Tech has distinguished itself particularly in projects that are better adapted, durable and more economic in the short-, medium- and long-term perspectives. SEA-INVEST’s leading expertise includes port handling and storage of liquid or solid bulk. SEA TECH is in charge of designing and realizing most of SEA-INVEST’s terminals as well as those of private customers. SEA-TECH developed many solutions for the handling, the storage and the logistics of terminals throughout the world. The company enjoys a privileged relationship with port authorities, which enables them to optimize their activities. Whether for handling coal, bauxite, cement, aggregates, scrap metal, biomass, or other dry bulk cargoes goods each solution is based on the expertise and know-how of SEA-TECH. The company has equipped its terminals with nearly 200 Cat® wheel loaders, from 914 compact wheel loaders to 988 large wheel loaders. Mainly 966 and 988 on big vessels in Europe, and 950 and 980 on smaller vessels in Africa, to handle dry bulk. Cat dealers support SEA-TECH in responding to the group and its clients’ needs. This terminal is designed to receive 200,000 tonnes per month of clinker or fertilizer and export minerals. Ships are unloaded in 48–72 hours by a mobile crane on tyres. The dry bulk products are directly fed into a hopper which filters the dust. It is then loaded on trucks or connected on mobile conveyors band. Cat 950 supports cranes to load and unload vessels between 25,000 and 40,000 tonnes, and feed bagging machines for fertilizer. Cat 980 works on different stockpiles and support cranes during loading minerals. Located on the Baltic Sea and originally designed for coal, the port of Gdansk now handles products for the steel and civil work industries such as iron ore and aggregates. Ships are unloaded with a crane directly linked to a 15-ha stockyard. Stacker reclaimers and conveyor belts automatically feed the trains and vessels loading systems. This terminal is equipped with three Cat 966 with bucket capacities of 2.5–9.2m3, that go in the ship hold and load the vessels of Capesize. Three Cat 988 with bucket capacities of 6.4–7.6m3 help manage the stockpiles of cargoes. One Cat 262 skid steer and a Cat 914 wheel loader pick-up the spills and sweep the areas to keep the terminal clean. Cat wheel loaders are equipped with high performance engines and efficient hydraulics, especially effective when working at the bottom of the pile, to move large volumes of materials in fewer passes. With salt and humidity, the marine environment is rough on the equipment. Corrosive products such as fertilizers and coal can further impact the machines condition and components life. For such environments, Caterpillar offers an anti-corrosion package which provides extensive protection to vital machine components and surfaces typically affected by corrosive materials. In addition, the anti-corrosion paint process provides a paint thickness that is more than twice the standard thickness for extra resistance. Cat 988 K series marks the 50th anniversary of the 988 delivering reliable, profitable performance for worldwide customers. 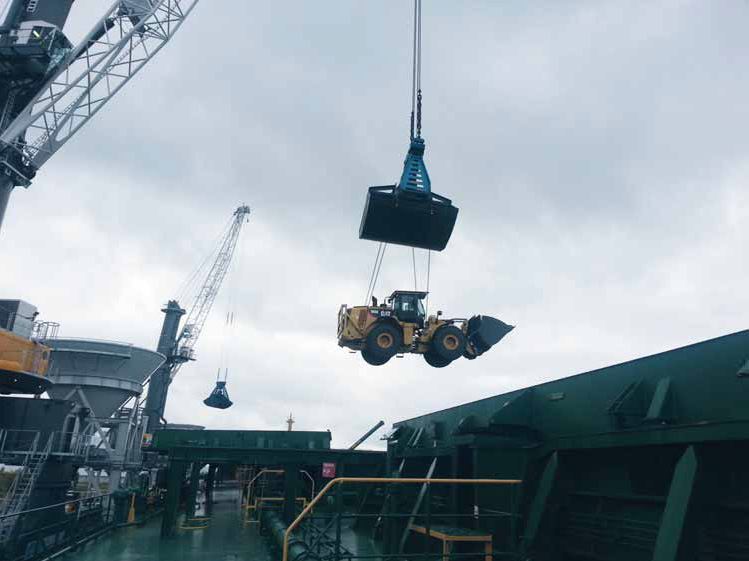 Designed as an optimum dry bulk handling equipment for port applications, the Cat 988 features enhanced loader linkage; meets various emission standards, drive train improved cab and enhancements in safety and serviceability. For added safety there is a remote panel, which houses a stairway light switch, engine shutdown switch, and lockouts for the transmission and engine starter. A second panel provides convenient access to the battery disconnect switch and a jump- start receptacle. A rearview camera system provides crisp images via the in-cab monitor. Routine maintenance points are easily accessed, including hydraulic pressure taps and oil sampling ports. Cat 966 model is commonly used in aggregates, sand and gravel, batch plants and industrial applications where Cat machines help in poor underfoot conditions to respond to challenging job deadlines. With its ability to engage on-the-go and to transfer 100% of the torque to the wheel with traction, the disc-type differential locks will improve tractive ability in these applications thereby increasing productivity. The Cat FusionTM coupler allows to quickly adapt bucket size to the density of material without impacting the performance of the machine since the centre of gravity of the load remains almost unchanged. In this confined working environment, operators also enjoy the comfort and ease of operation of the light effort seat mounted controls for steering and hydraulic implements. Additional high efficiency lighting and guards customize the machines to this severe application. The Cat 980 model offers performance with the capability to work in the most demanding applications. But it also offers an unmatched operator comfort and efficiency in a world class cab. Revolutionary electronics and hydraulics are integrated for low- effort operation. Cat 980 increases productivity with equates lower owning and operating costs. Cat 950 is well-suited for stockpiling, truck loading, material handling, hopper charging and load-and-carry work in applications such as sand and gravel stockpiling, coal operations, storage yards, concrete for job-site preparation and general cleanup. The loader also is an exceptional choice for governmental bids, offering agencies a well-designed, durable machine that fits the budget. The result is a machine of exceptional value. EU Stage IV engine regeneration system SEA-TECH voiced concerns about regeneration and interruption of the work cycle, but Caterpillar explained its after-treatment regeneration strategy for both Stage IIIB and Stage IV is transparent to the operator and does not interrupt the operation of the machine. “A 966 & 988 can work for three consecutive days thanks to the engine regeneration.” However, apart from during the shift change, the machines are run continuously for approximately eight hours. This allows the Cat 966 and 988 to operate without regeneration needed during their full shift, up to approximately 32 hours. This operation can also be carried out manually when the operator is having a break. Indeed, the regeneration process doesn’t affect the machine performance; once working in normal conditions the Diesel Particulate Filter (DPF) hardly builds-up soot. The Cat 950 is even easier to use since it needs passive regeneration only. SEA-TECH’s investment strategy is to rationalize the configuration of its wheel loaders. The main objectives are to simplify the investment process and to increase fleet efficiency, utilization and management. A standard configuration can be used on multiple jobs with multiple work-tools. In addition, the Cat next generation Vital Information Management System VIMSTM provides extended features to the operator, including real-time fuel consumption and fuel efficiency (material loaded per unit of fuel) data through an interactive touch screen. These new technology and service provide an increasing ability for customers to monitor, manage and enhance operations. The main objective is to improve control over their operation reducing their cost and increasing their profit. It’s the reason why, as the next step SEA-TECH would like to deploy VisionLink® web interface to manage fleet effectiveness and increase productivity. Another critical aspect to port applications product offering is Caterpillar’s ability to support its machines with an active dealer network throughout the world. In addition, the local dealer has a real impact on SEA-TECH choice of machines and maintenance options. The comprehensive product support solutions helped convince SEA-TECH to choose Cat equipment to maximize uptime and to benefit from the highest return on their equipment investment. With the ability to handle a multitude of materials such as aggregates, fertilizers, minerals, coal, ores, woods and vegetables, machines are in operation across two continents in the harshest environments. From the blistering summer heats of the Ivory Coast to the chilling winter winds of Netherlands, the local dealers are helping from choosing the right machine to knowledgeable support. Mobile equipment manufacturers are playing a vital role in helping to increase safety for workers through the design and development of new machinery. Additional protection features like window guards, the integrated rear view camera or the advanced filtration system removing most particles before they even reach the cab filter are now common place, enhancing both operator safety and helping to minimize damage to machines, even when working in difficult environments and with corrosive products. SEA TECH operators are highly satisfied with Cat machines because they are safe and comfortable, but the most significant aspect for them is that the machines are stable. Ensuring operators are safe, confident in control of their machines and have clean, comfortable and quiet operating environments with controls that are intuitive and low effort, all contribute to lower operator fatigue and better performance. In addition, the Cat 988 and 980 wheel loaders are equipped with high-performance engines and efficient hydraulics. These are effective when used at the bottom of a stockpile or in order to move large volumes of materials in fewer passes. The key feature is its stability, especially when working on uneven grounds. SEA-TECH has chosen Caterpillar and its dealer network to improve machine reliability, durability and to increase fleet efficiency and management in demanding corrosive environments. Cat dealers help customers choose advantageous dry bulk handling equipment for port applications and offer comprehensive local support adapted and fit to these customer needs.